5 Little Bears is located conveniently at Far East Plaza, and serves popular Taiwanese food like Oyster Mee Sua, Braised Pork Belly Rice & Salted Crispy Chicken. The inside of the restaurant is free seating style where you have to order your food at the counter, and they will call your number to pick it up when the food is ready. For my meal today, I ordered a portion of the Salted Crispy Chicken & a bowl of Oyster Mee Sua. 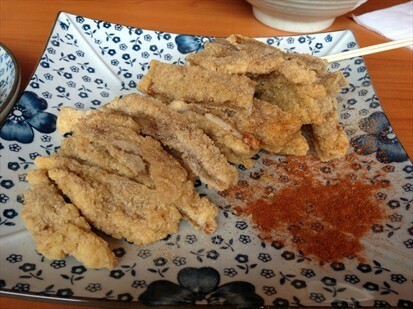 For the Salted Crispy Chicken, I felt that it was too dry and very hard. I was quite disappointed with this dish as all I could taste is the flour and hardly any chicken. 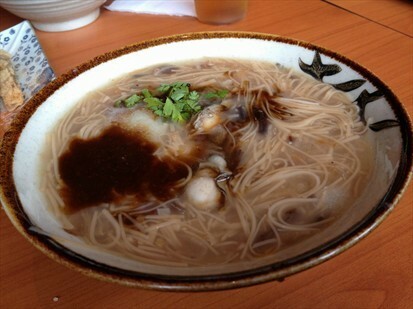 The Oyster Mee Sua however was not bad. It's flavourful and silky smooth, easy enough to eat with just a spoon. Even though we visited the restaurant during lunch time, there was plenty of seats and not much of a crowd. Great place to get a quick meal. 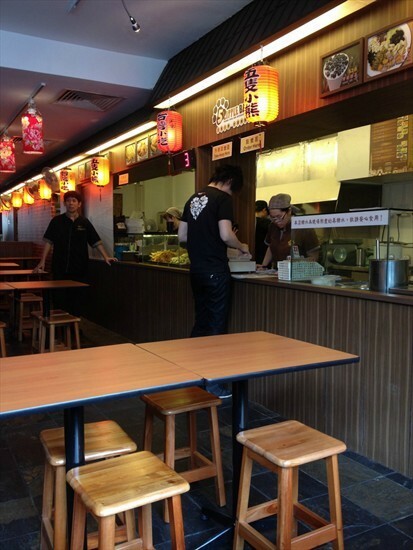 Arashi Yakiniku Charchoal Grill is located at Boat Quay along Singapore river, a popular location among foreigners & Singaporeans alike for great seafood and some beer. The restaurant emits a strong Japanese ambiance with their spotless clean wooden furniture and Tatami rooms. Their high quality grill system were also specially imported from Japan to ensure that customers do not leave smelly at the end of their meal. The Ninniku Gohan ($4.80) is a must-order. The Garlic Fried Rice is light with a hint of saltiness + the fragrance of fresh garlic. Very yummy indeed. At only $4.80 for a bowl, this is definitely one of the nicest yet super value for money Garlic Fried Rice that I've had. And of cos, we can't miss out on the BBQ meat. The meat served at Arashi is definitely the best. Look at how pretty they look with the nice fats distributions. The meat cooks really fast due to how thinly sliced they are, but yet they not too thin that you can hardly taste them. In fact they are just the right sizes to enjoy mouth watering juicy meat that literally melts in your mouth. Meat are also served with various dripping sauces and my favourite is a ponzu sauce that is just a little tangy - perfect for bringing out the flavours and open up my appetite for more food. Other than meat, Arashi also have the Assorted Seafood Platter ($28.80). The salmon comes marinated in a Japanese sweet-ish sauce, which I'm not really a fan of. However I do enjoy the scallop & tiger prawns which were very fresh. Overall, I would say that the food here is really fantastic with one of the best services I had received. We came in a group of about 10 pax and had one of the rooms to ourselves. 2 very polite service staffs attended to our table and throughout the meal, and they were very attentive to change our plates, the charcoals and topped up our tea. They seems well-trained as well, and was able to recommend sauces to go with each type of meat. Definitely highly recommended for high quality Japanese Charcoal Grill at affordable prices. A great place to hang with a group of friends. A small little cafe tucked away in a corner of Robertson Quay, Bridger's Cafe is owned by a Korean couple & had a seating capacity of about only 20. But don't let it's appearance fool you, this little cafe serves great quality food at humble pricings, lovingly made & served by the Korean owners themselves. The Turkish Eggs is quite a delightful item on the menu, with a thin layer of slightly runny eggs with tomato paste, topped with Mozzarella Cheese & Premium Sausage. I especially like salty & slightly tangy flavour of this dish. The toast is abit hard, but does goes well with the eggs. The downside for this dish is that the portion is quite small. But it's really cheap so I guess it's okay if you treat it as an appetizer. I'm absolutely in love with this dish! Comes with Norwegian Smoked Salmon, lettuces, Mesclun leaves, poached eggs & potato, with a red wine + sesame dressing, a delicious plate of salad if you like Salmon. The sauce is what really sold me. It's tangy & bursting of flavours that I cant get enough of. Dont forget to use the toast to soak up the remaining of this savoury goodness when you are done with the salad!